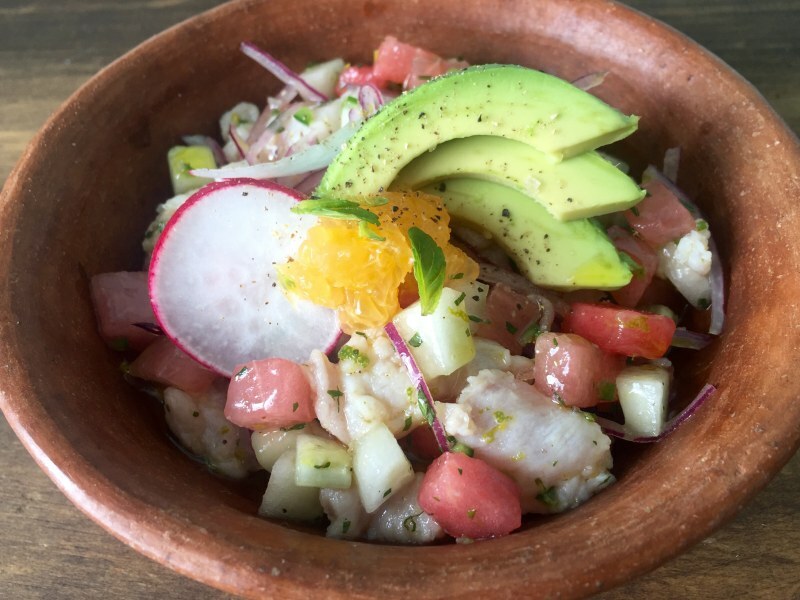 Ceviche is a Latin American dish consisting of marinated fish, fruit and lime juice, and also happens to be the perfect way to kick off a dinner party. It's not too heavy when served with tostadas or tortilla chips, and feels a little bit special—even though it's just as easy as making guacamole. Marinating snapper or halibut in a mixture of orange and lime juice for half an hour "cures" it so there's no need to cook the fish. Mixing the fish with watermelon, cucumber and mint makes for refreshing contrast, and serrano chiles add a little heat—though feel free to cut back on the serranos if you don't want it too spicy. 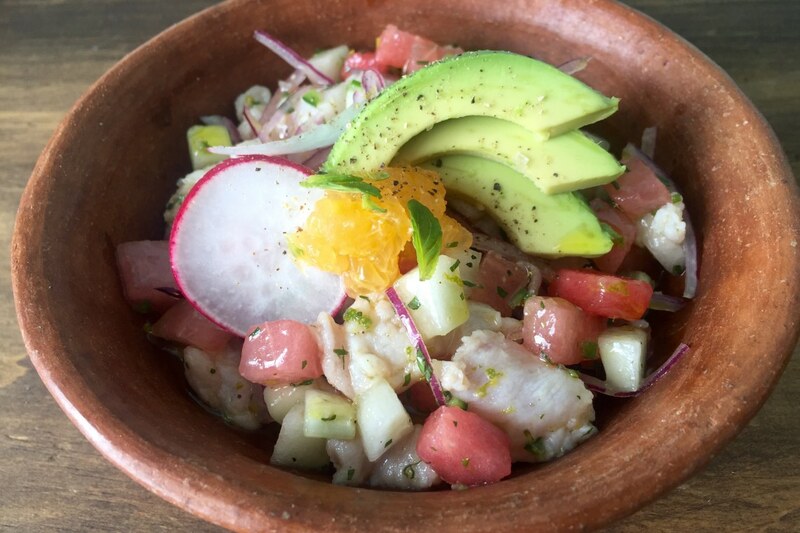 For a healthy and refreshing lunch or first course, serve the ceviche over a bed of mixed greens instead of with tostadas. You can also try different fruits and vegetables mixed in with the fish, such as segmented blood oranges or grapefruits, chopped tomatoes, or even corn kernels. Per Serving: 582 calories; 30g fat; 26.3g carbohydrates; 54g protein; 142mg cholesterol; 771mg sodium. This delicious ceviche was perfect for my house party. I just doubled the recipe in order to yield more servings. The serrano chile was spicy but not overpowering. Overall really good dish. I love ceviche and this recipe with the watermelon and serrano peppers was the perfect mix of sweet and spicy. It's perfect as a dip with tortilla chips!